Vancouver, British Columbia - January 29, 2019 (Newsfile Corp.) (Investorideas.com Newswire) Cabral Gold Inc. (TSXV: CBR) (OTC Pink: CBGZF) ("Cabral" or the "Company") is pleased to announce that it has completed its first two diamond drill holes at the Machichie target at the Cuiú Cuiú Project, Pará State, northern Brazil. The high-grade potential of the Machichie target was first recognised in mid-2018 through channel sampling of artisanal workings (see press release dated July 19, 2018). Since then, an auger geochemical program has defined a broader gold anomaly extending along strike from the workings, coincident with a significant copper-molybdenum ("Cu-Mo") anomaly, and a program of channel sampling of structures in the main artisanal workings has continued. The east-west structures of the Machichie target have never been previously drilled. The target is located just 500m north of Cabral's MG gold deposit which is one of four deposits with defined resources at Cuiú Cuiú. The first two diamond drill holes have been completed at Machiche, successfully tracing quartz veins containing-pyrite approximately 50m vertically below the base of artisanal workings. Core is being cut and samples will shortly be sent to the laboratory for analysis. Top-of saprolite auger geochemical drilling outlined a significant gold anomaly extending more broadly along strike from the limit of the artisanal workings. Together with recent sampling, the results suggest the Machichie target extends over at least 1.1km. 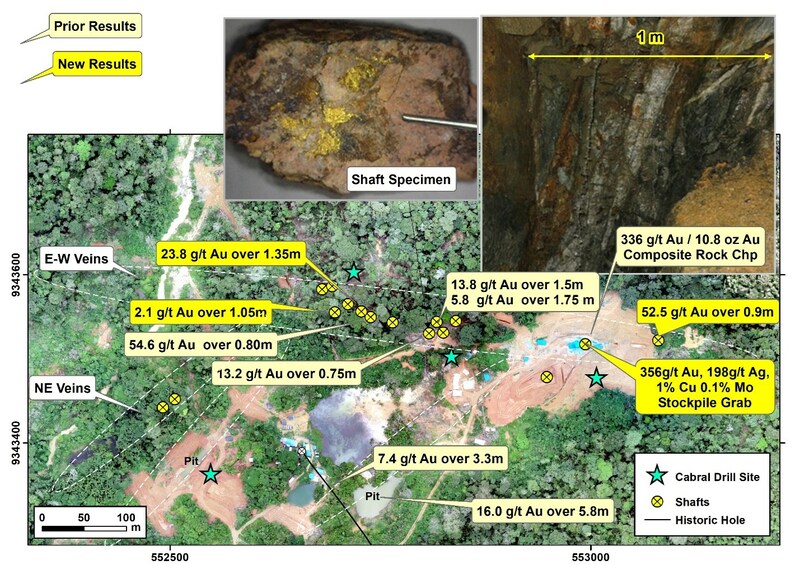 Unlike all the other targets identified thus far at Cuiú Cuiú, the auger drilling has also defined a significant Cu-Mo anomaly which is coincident with the gold ("Au") anomaly. This is best developed to the east where a strong IP chargeability anomaly is also present. The Machichie target is located just 500m north of the MG deposit. MG is currently the second largest gold deposit known at Cuiú Cuiú, with an Inferred Resource of 8.6MMt @ 1.45g/t Au (0.4MMoz of gold)  . Machichie was selected as a high priority drill target following the mid-2018 discovery of high-grade gold mineralization from recently developed artisanal shafts. Altered rocks in the muck-pile from the workings contain considerable pyrite, along with molybdenite, scheelite, and minor chalcopyrite. A composite grab sample returned 336 g/t Au from a 1m wide quartz-pyrite vein in the principal shaft in the area. 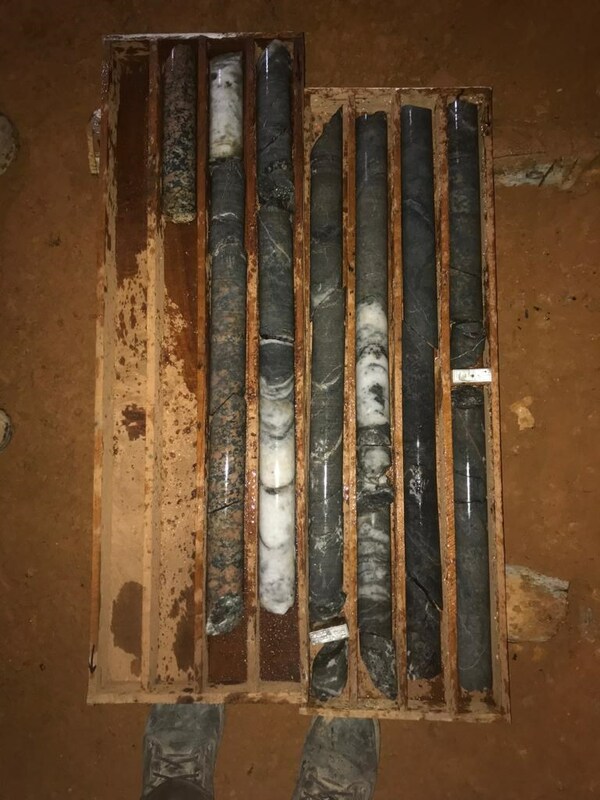 Results from channel sampling in subsidiary shafts and galleries in weathered bedrock along strike included 54.6 g/t Au over 0.80m, 13.8 g/t Au over 1.5m, 13.2 g/t Au over 0.75m and 5.8 g/t Au over 1.75m. A recent grab sample from stockpiles of the principal shaft returned 356 g/t Au, 198 g/t Ag, 1% Cu and 0.1% Mo (Figure 1). Figure 1: Detailed drone orthophoto view of the new Machichie discovery area with sample results pit, trench and shaft locations, along with photos of samples and workings. The diamond drill program has commenced with two diamond drill holes completed on section 553005E. These drill holes have traced the structure in bedrock to a depth of 50m vertically below the base of the principal working (Figure 2). The workings extend to a depth of 17m below surface and have recently been terminated at the water table. The Machichie structure is characterized by a subtle east-west trending magnetic low which is coincident with the high-grade mineralization observed on surface. Additional magnetic lows along strike to the east and west of the artisanal shafts were targeted with follow up auger sampling and suggest that the structure extends at least 1.1km along strike. In late 2018, efforts were aimed at determining the strike extent of the Machichie structure. This work has resulted in the identification of significant mineralization including 23.8 g/t Au over 1.35m and 2.1 g/t Au over 1.05m located 350m along strike and west of the main artisanal shaft. Figure 2: Recent drill core from Machichie. Assay results are pending. 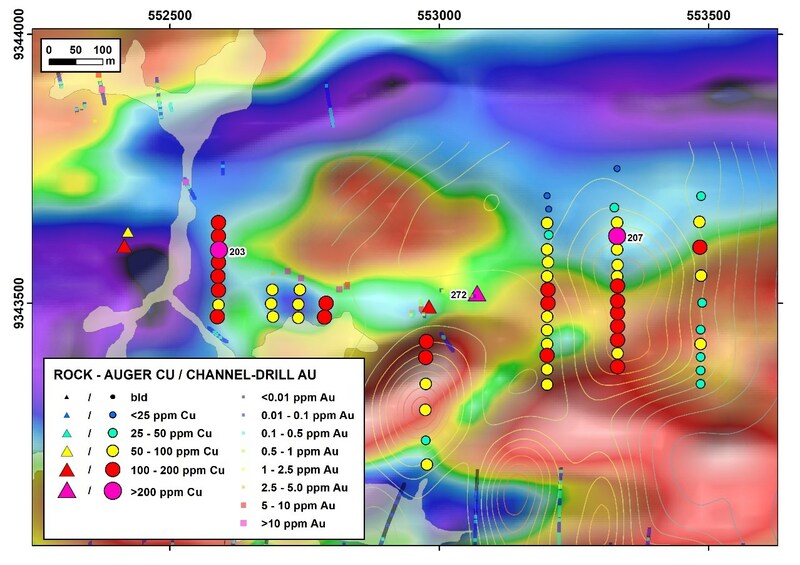 In addition, results from four lines of shallow auger holes which were completed to the west of the main artisanal shaft have revealed a strong coincident Au and Cu anomaly with values up to 203ppm Cu and 200ppb Au. Rock grab samples collected approximately 175m further west of the most westerly auger line returned values of 5.5 g/t and 3.1 g/t Au, suggesting the Machichie structure remains open to the west. 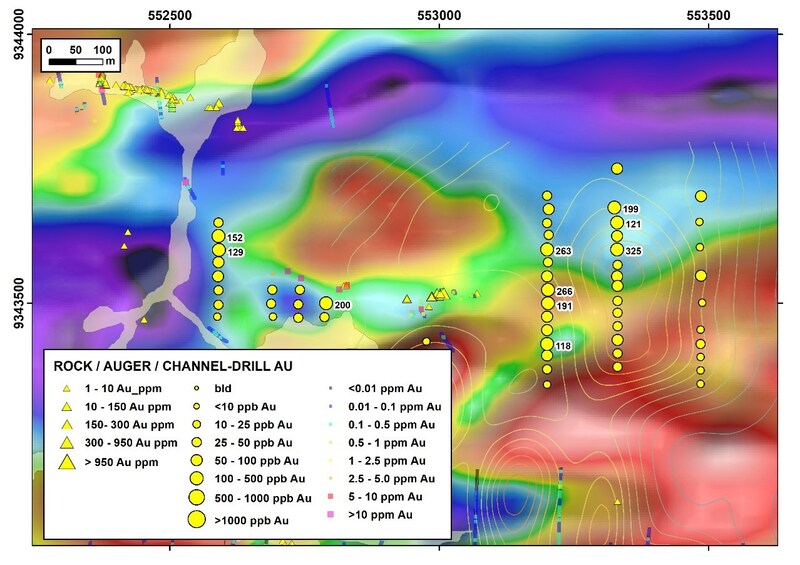 In addition, recent channel sampling east of the main artisanal shaft at Machichie returned 52.5 g/t Au over 0.9m from a position 70m east of the principal shaft. An additional four diamond drill holes are planned at Machichie to the east and west of the initial two holes which were drilled directly under the main artisanal shaft. Shallow auger drilling below thick overburden cover east of the artisanal workings at Machichie was conducted in late 2018 and has revealed an even stronger and larger Au-Cu-Mo anomaly than that to the west. A broad gold anomaly is evident over 300 x 350m with values up to 325ppb gold located approximately 300m east of the main artisanal shaft (Figure 3) and is coincident with elevated Cu values up to 207ppm (Figure 4) and a well-defined Mo anomaly with values ranging from 10 - 152ppm Mo (Figure 5). Background Mo values throughout the Cuiú Cuiú project area are generally below the detection limit of 3ppm. The Au-Cu-Mo anomaly at Machichie East is coincident with a magnetic anomaly, and more importantly a well-defined chargeability anomaly at depth which was defined by a historic IP survey. A strong correlation exists at the MG deposit between zones of high chargeability and high-grade parts of the deposit. The Machichie East target will be drill tested following completion of drilling at Machichie. Figure 3: Map showing Machichie and Machichie East targets with magnetic imagery, IP chargeability contours and gold from top of bedrock auger sampling. Figure 4: Map showing Machichie and Machichie East targets with magnetic imagery, IP chargeability contours and copper from top of bedrock auger sampling. Figure 5: Map showing Machichie and Machichie East targets with magnetic imagery, IP chargeability contours and molybdenum from top of bedrock auger sampling. Alan Carter, President & CEO commented "The recent surface channel sampling results and the auger geochemical target suggest the presence of a significant mineralized structure to the immediate north of the MG deposit. The presence of elevated copper and molybdenum values in conjunction with the gold, is unique so far amongst the various targets at Cuiú Cuiú. The diamond drill campaign will add valuable information regarding the depth projection of the Machichie structure and the significance of the copper-molybdenum-gold signature at Machichie East. We look forward to the drill results of the program". On January 23, 2019, Cabral's Board of Directors approved the granting stock options to various employees, directors and consultants pursuant to the Company's stock option plan. The stock options entitle the holders to purchase a total of 1,694,672 common shares in the capital stock of the Company at a price of $0.25 per common share. The stock options are exercisable until January 22, 2024 and are subject to vesting over 24 months. Of the total grant, 1,304,672 stock options were granted to members of management and directors of the Company and 50,000 stock options were granted to its Corporate Communications Manager, a person engaged to provide, among other things, promotional activities on behalf of the Company (see news release of November 19, 2018). Gold analysis has been conducted by SGS method FAA505 (fire assay of 50g charge), with higher grade samples checked by FAA525 or screen fire assay. Multi-element analysis is conducted by four acid digest and ICP-OES analysis. Analytical quality is monitored by certified references and blanks. Until dispatch, samples are stored under the supervision the Company's exploration office. The samples are couriered to the assay laboratory using a commercial contractor. Pulps are returned to the Company and archived. Channel sampling is conducted using a hand-trenching tool over exposed faces to maintain a consistent sample. The high-grade Machichie sample was collected in run-of-mine stockpiles from the artisanal processing operation. The historical induced polarization survey was a 3D IP survey conducted for Magellan Minerals Ltd. in 2012 by SJ Geophysics Ltd. The survey used a GDD TX II Transmitter and a SJ-24 Full Waveform receiver. The survey was conducted on 100m spacings lines with a dipole size of 50m and an array length of 500 to 750m. Geophysical exploration targets are preliminary in nature and not conclusive evidence of the likelihood of a mineral deposit. Under the agreement with the Cuiú Cuiú condominium, local artisanal operators can process mineralization to a depth of 30m, unless otherwise negotiated. Shafts generally stop at or above the depth of the water-table. Historical drilling results are reported as down-hole length weighted intersections unless otherwise stated. Micon NI 43-101 amended resource estimate dated 19 December 2018.